A hand-coloured print of a residence at Garden Reach, Calcutta, from the Fiebig Collection: Views of Calcutta and Surrounding Districts, taken by Frederick Fiebig in 1851. Garden Reach, a suburb of Calcutta, was an area on the River Hooghly where many Europeans built large 'Garden Houses' with grounds sweeping down to the river's edge. 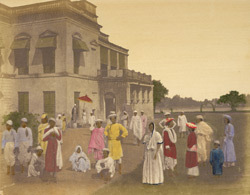 The row of palladian mansions lining the river approach to the city provided an impressive view and made this one of the most fashionable areas of Calcutta. This is a vew looking towards the private residence of a Englishman in the Garden Reach district, the servants are posed in the foreground and the owner, standing beneath an umbrella, is in the background.